This hefty photographic compendium provides a novel approach at the identification of the amazing technicolor myriad of North American Warblers. 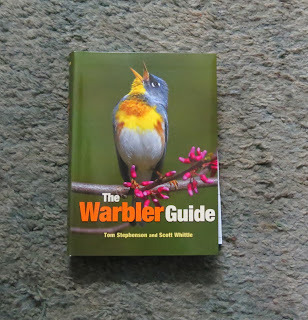 It is most unlike previous works on this genera and is putatively designed to help you quickly and confidently identify the species, as well as age and gender any warbler you encounter in the United States and Canada. Although nicely sized, it is far from being a field guide, weighing in at over a kilogram ! 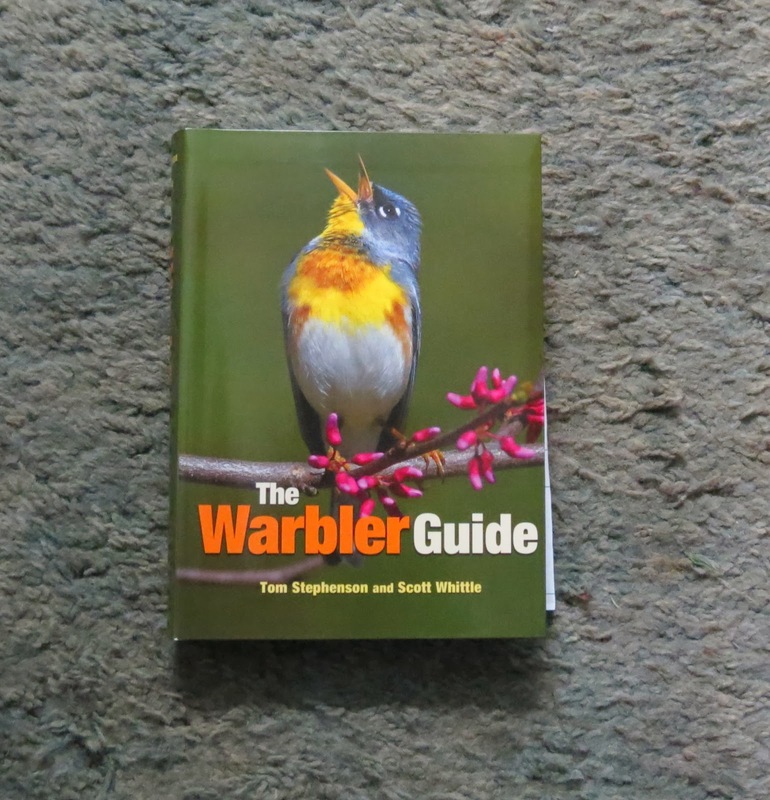 In light of its target goal, the two authors have included the following sections - Visual Finders, Song and Call Finders, a Topographic Tour and What to notice on a Warbler, the Species Accounts, Ageing and Sexing sections and Vocalisations. Utilising a number of icons and key terms, the introductory chapter actually extends to an overwhelming 137 pages, highlighting virtually everything you ever need to know about the genera - the photographic reference material is simply sumptuous. What was most intriguing (as well as informative and highly detailed) was the 'understanding sonograms' section, this alone running to over 40 pages, whilst the 'Visual Finder Guides' on pages 101-115 were particularly useful. The largest chunk of the tomb is reserved for the detailed accounts of each species of warbler that breeds in the New World, each depicted and presented in alphabetical order (from American Redstart to Yellow-throated Warbler). On average, six pages are devoted to each species, the first with between two and eight images highlighting each plumage, followed by a multitude of smaller additional photographs highlighting the salient features and depicting the species in a myriad of postures. This was very impressive indeed, highly illuminating, and incorporating additional pages on ageing and sexing, distribution in summer and winter and an exhaustive section on vocabulary. Where sexes differ greatly, as with the Black-throated Blue Warbler or American Redstart, the female is treated completely separately and given equal space. With so many images crammed into a confined space, there is little room for text, but the authors have chosen to concentrate on known field characteristics and differences, and notes companioning 'additional photos' easily make up for any shortfall. For me, this was an extremely good selling point, the detail included being of an ample and highly workable nature. I soon found myself picking the book up again and again, not least to study the Cape May Warbler insertion. Following Yellow-throated Warbler is the insertion of a further seven species (Crescent-chested, Fan-tailed, Golden-crowned, Rufous-capped and Slate-throated Warblers, Gray-crowned Yellowthroat and Tropical Parula) - vagrants from the tropical regions to the Mexican border (primarily to Texas & Arizona) and each given a two-page spread. Yellow-breasted Chat and Olive Warbler are also featured too, both once being considered as 'warblers'. In summary, I cannot recommend this book highly enough, especially if you visit the likes of North America on a regular basis or wish to become familiar with the genus from a UK vagrant perspective. It is also available at an incredibly cheap price - £19.95 - and is published by Princeton University Press.